IRVING, Texas--(BUSINESS WIRE)--Vizient, Inc. today announced that it is ranked fifth among 25 firms in the annual Modern Healthcare survey of the largest health care management consulting firms. 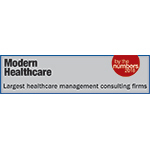 “Vizient is proud to be ranked by Modern Healthcare as one of the largest health care management consulting firms in the country. We believe our inclusion in this list reflects the confidence our members have in our ability to assist them in reducing unnecessary clinical and operational variation to achieve a sustainable cost structure, improving clinical outcomes and executing growth strategies that lead to greater success in their markets,” said Bharat Sundaram, president of analytics and advisory services for Vizient. The Modern Healthcare 2018 Health care Management Consulting Firms Survey includes United States management consulting firms that consult in various sectors of the medical industry. Survey results are compiled to create the annual list of the largest health care management consulting firms, and final rankings are based on 2017 health care provider revenue. Vizient uses its combined capabilities in sourcing, analytic, advisory and collaboration services to connect its members with the knowledge, solutions and expertise that accelerate performance. The organization’s solution framework is designed to ensure its members are positioned to deliver exceptional, cost-effective care. Vizient, Inc., the largest member-driven health care performance improvement company in the country, provides innovative data-driven solutions, expertise and collaborative opportunities that lead to improved patient outcomes and lower costs. Vizient’s diverse membership and customer base includes academic medical centers, pediatric facilities, community hospitals, integrated health delivery networks and non-acute health care providers and represents approximately $100 billion in annual purchasing volume. The Vizient brand identity represents the integration of VHA Inc., University HealthSystem Consortium and Novation, which combined in 2015, as well as the recently acquired MedAssets’ Spend and Clinical Resource Management (SCM) segment, which includes Sg2. In 2018, Vizient again received a World’s Most Ethical Company designation from the Ethisphere Institute. Vizient’s headquarters are in Irving, Texas, with locations in Chicago and other cities across the United States. Please visit www.vizientinc.com as well as our newsroom, blog, Twitter, LinkedIn and YouTube pages for more information about the company.